Welcome to Episode #38 of the Living Homegrown Podcast! This is a short little episode explaining how to make your own cultured butter with little effort. Now if you have never had cultured butter before you are in for a real treat. Homemade butter itself is amazing but when you take it a step further and make cultured butter it is beyond amazing. You get two bonus products in the process! 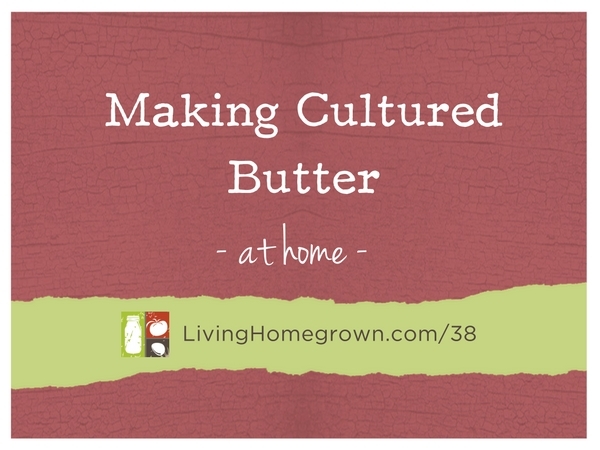 You may not want to make cultured butter all the time. But you should certainly do it once in your lifetime so you can experience it. Here’s the full printable recipe with photos of all the stages. This sounds like a wonderful recipe to make. You’re trying to “butter us up” in the new year, aren’t you? HA! Have you ever tried this cultured butter on popcorn? I kind of wondered how it compared to regular butter. I make popcorn and sometimes I mix half and half butter and extra virgin olive oil, so I am only feel half as guilty using butter on my popcorn. Ha ha ha Craig. I have not tried it on popcorn, but I think it would be delish. I have not tried the half butter/half olive oil trick. I may have to give that a shot! I have finally decided to make cultured butter and I’m a happy camper. To my surprise this project was much easier than I expected. I could live on good crusty bread and creamy delicious butter. I’m a happier southern girl from New Oleans.. So glad you dove in Debbie! I made the cultured butter without ever making butter before so when the mixture separated into the butter and bowl of buttermilk it was quite impressive! Super easy to do and the TASTE IS AWESOME! Whoot! Fantastic Andrea. So glad you tried it. Mine didn’t separate. 🙁 I whipped it till it had the texture of heavy sour cream but it stayed like that and didn’t turn into butter. Any thoughts? I keep requesting the PDF but it never arrives. So Sorry Jeff. I just sent you an email with the PDF. I will check and verify all is working now, but thanks for letting me know. Got the PDF. Now if I could just find heavy cream that is not ultra-pasteurized. Every store I’ve checked here in sunny Florida has only ultra_pasteurized. Ok, trying this now, had it going for two days and about to take it out of the jar and into the cheesecloth. Funny thing about that.. had to go to three places to even find some cheesecloth.. at the third place.. the employee asked “what’s that”. We’re doomed. Anyway, both batches have the the same cream, but one has buttermilk, the other with yogurt.. We’ll see.